We thought it was gonna be lightish winds from the south but it ended up being quite significant from the SE, which made crossing to the rim harder than usual. A bunch of people opted to fly the airport side north, while those of us who crossed to Farnham canyon had to scunge along the rim pretty much all the way to Brewster where we finally got 3400m. Alex and I were team flying up to this point, but as we dove off the edge of the rim at Brewster we got separated as he opted to take the middle-of-the-valley route while I crossed to the east side of highway 97. The lift on the other side wasn't very good and the SE winds kept blowing me off the rim; it was hard to stay established over there. 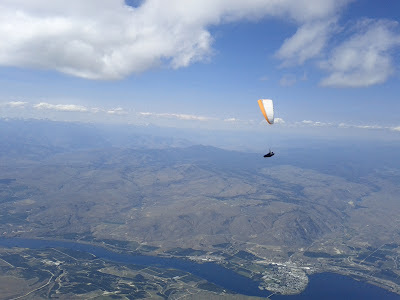 I finally got a bit low at which point the valley breeze kicked in and I ended up landing just south of Okanagon at around the 75km mark with a Seattle pilot. Those who had taken the more in-valley route had a much better line and were able to stay higher and out of the valley breeze and keep going north: to Omak, Tonaskat, and Oroville. Alex made it to Oroville for something like 140km, and several pilots made it to Tonaskat at 125km. Many pilots landed very soon after going on glide from the Butte, but those that went back up for a reflight ended up getting a much better #2 flight. I was pretty happy to not have bombed out like yesterday :) but it would have been nice to keep going until at least the 100km mark. Since I was in front of the small group I was with, the other pilots were able to watch my line and take a different one if it seemed to not be working…sometimes it doesn't pay to be in front :) Also note to self…when it's SE and blowing off the rim, once past Brewster it may be better to fly the middle of the valley rather than committing to either side. A few years ago on a similar wind direction day those pilots who flew the middle of the valley got the furthest…I think by catching the east-side thermals as they lean over into the middle of the valley. If we have another day like today and we end up going north, I may try that line!